I love S Club 7. I love them. 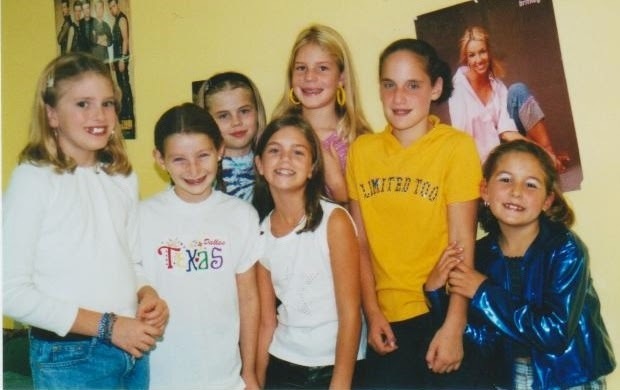 I love them so much that at my fourth grade birthday party (see above) I gave out their first CD as a party favor. I performed a talent show routine at summer camp to "Bring It All Back", one of my top five favorite songs ever. They have both my first and middle names represented in the group. They starred on a ridiculously good TV show ("Miami 7"). They made insanely good pop music. Seriously, if you don't know the words to "S Club Party" then idk what to tell you. To me, S Club 7 seems like a group of super relatable people who just happened to make great pop music that made you want to dance. Recently the band announced that they would be reuniting for the BBC's Children in Need benefit show (you better believe I had a major fangirl moment when I heard the news), and I knew I had to write about their pop perfection. As far as music goes, S Club 7 had it down. Their first album, S Club, is still one of my favorites, hence the reason I gave it out as a party favor, and I regularly listen to it on road trips. One of the things that I love most about it is that every song sounds different. You can't really mistake one song for another, because they all have their own unique sound. There are also a few different musical styles going on in there, a cool departure from the bubblegum pop standard, which, while it definitely makes appearances, it's tweaked in just the right way to make the music sound a new and different from what was popular at the time. My favorite tracks from this album are "Bring It All Back" (duh), "S Club Party", and "Everybody Wants Ya". Honorable mention goes to "I Really Miss You" bc Rachel just gives the feels hard on that one. Now I have to confess that I don't own a copy of the band's third album Sunshine, but I do know all the words to the lead single "Don't Stop Movin'" and, thanks to YouTube, am all caught up on what I missed while I was cheating on pop music with Alicia Keys' first album. As far as Sunshine is concerned, it still definitely delivers the S Club 7 sound, but the messages and lyrics seem like the group took a deeper dive into the maturity waters. The dance tracks on this album also have more of a club feel than the group's earlier efforts, probably due to more bass and a little bit of a disco vibe. Things can definitely get a bit cheesy at times, but they're just being earnest so I forgive them. Sunshine is still classic S Club 7, aka playful and energetic with a few mellow-out sessions in between. High points of this record include "Don't Stop Movin'", "You", and "Have You Ever". As far as I'm concerned, S Club 7 isn't S Club 7 without all seven members, although the remaining six members did release a fourth album, Seeing Double, after Paul left the group. But no need to dwell on these dark times, because the whole group will be together again on Friday! Is anyone else as freakishly excited about this as I am? What songs do you hope they'll sing? What's your favorite S Club jam?! And if you haven't understood a word of this post, I invite you to click play on this and try not to dance. I dare you.